Beneath the hatch on the Ayats electric open topper. Castrosua new City Scania CNG bus. Spain’s major bus and coach show highlights the latest developments from the country’s manufacturers as well as those from the rest of Europe and beyond and this year’s event reflected the increasing optimism within a Spanish market that was hard hit by the recession, especially in terms of the public transport market. 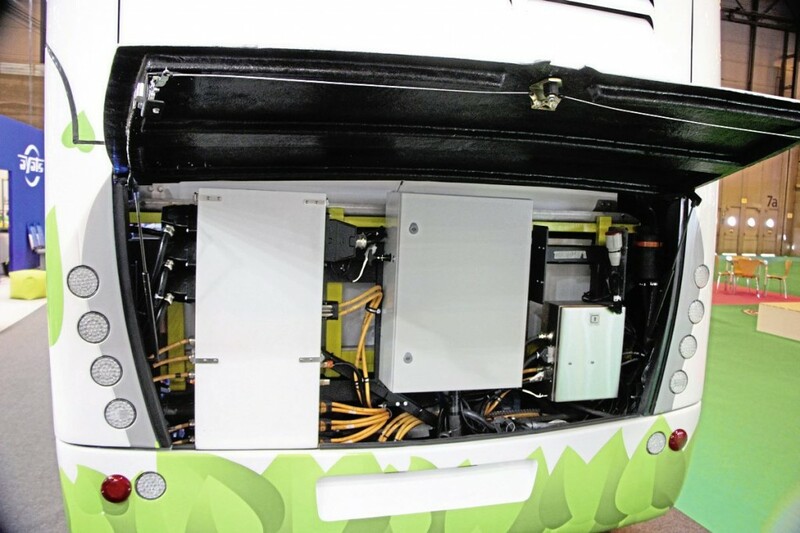 In bus the trends are strongly towards alternatives to diesel, particularly electric options, but gas is also popular in the country and evidence of this could be seen in inter-urban coach as well as bus applications. In the coach sector Spanish operators are far more open to integral concepts than they once were though there is still strong interest in body on chassis and an enduring, though perhaps diminishing, willingness among chassis suppliers to work with more coachbuilders than we have become accustomed to in the UK. Unbodied chassis were much in evidence on the major manufacturers’ stands. In mini and midi markets the number of players with innovative options on Sprinter or Daily never ceases to amaze and the acceptability of front engines in truck derived chassis appears undiminished. In this 13th staging of the bi-annual FIAA event, the presence of suppliers from outside Spain is far stronger and more varied than it was when I first attended several decades ago. The following is by no means a comprehensive revue but it seeks to bring you news of the more significant developments on a manufacturer by manufacturer basis, rather than rigidly splitting along bus, coach and minibus lines because many manufacturers serve multiple sectors. 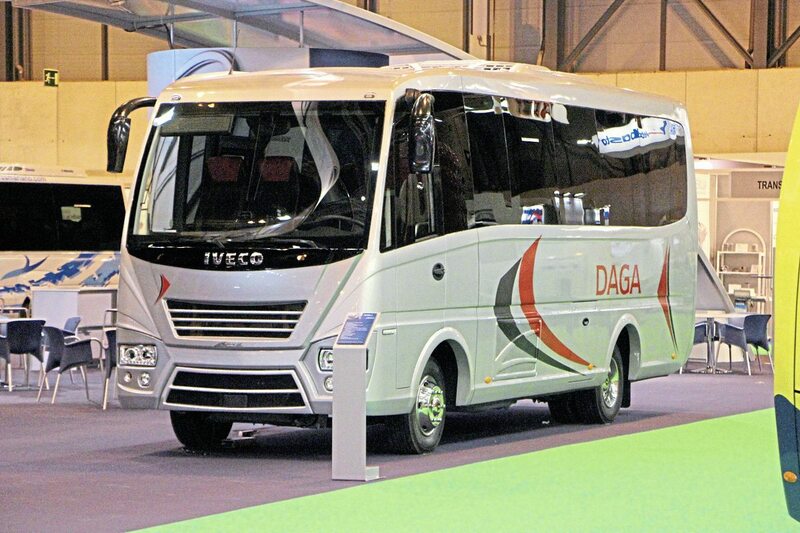 Dominating the Spanish market and with a growing worldwide presence as well as a rapidly expanding range of integral and body on chassis products, Irizar showed six varied vehicles, all of them integrals, three on each side of a central stage and hospitality area. Several will be of interest to UK buyers. Irizar believes it now has ‘one of the best ranges of buses and coaches offered by any manufacturer.’ However, they promise they will not rest on their laurels and are already working on future projects including autonomous driving. Readers will by now be familiar with the top of the range i8 coach, shown in 14m three-axle form with DAF/Paccar MX13 520hp engine, but they won’t have seen the new i6S which has already been launched in Europe but won’t arrive in the UK until this year’s Birmingham show. It is located between the i6 and i8 in the range but they didn’t want to call it the i7. In appearance it is much closer to the i8 but without the chromework and it won’t be available with a number of features that remain exclusive to the i8, among them the distinctive seats. Two were displayed, one a 15m tri-axle with 460hp MX13 engine and the other a 13m two-axle with 435hp MX11 unit. 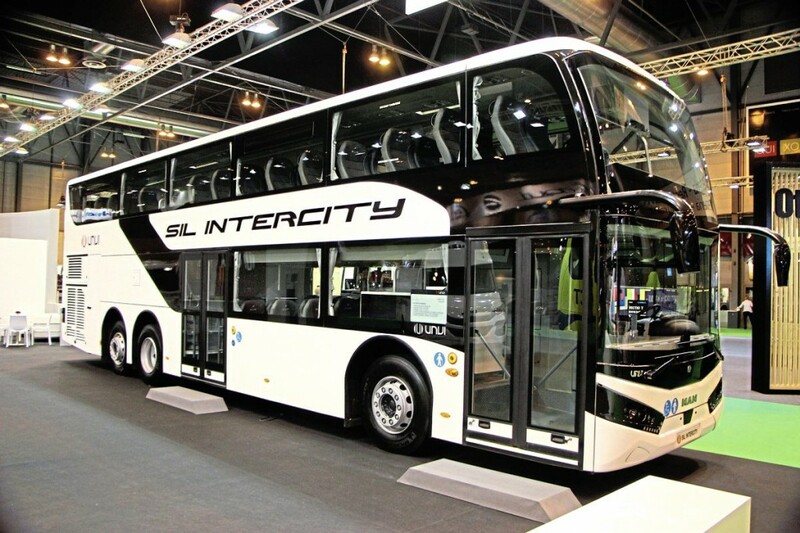 We are used to hybrids in city buses but they are rare on inter city and coach applications, something that might change if Irizar has its way. Last year they introduced new parallel hybrid versions of the i3 and i4 in Europe and that range has been extended with the announcement of additional 15m i4 and i3 options. Two-axle models up to 13m combine a 300hp 6.7-litre Cummins diesel with an Eaton pack matching a six-speed Eaton-Fuller robotic gearbox with inverter, a water cooled EDRIVE (44/65 KW) electric motor and MGL lithium-ion batteries. Tri-axle Irizar hybrids will have a Cummins 8.9L 370hp unit, ZF automatic six-speed transition gearbox and Irizar group developed batteries and hybridisation packages. The two hybrids shown were a 13m i4h with 55 seats and a 12.75m i3h low entry with 45 seats. Figures from vehicles in service suggest a 21% fuel saving. Remarkably, the 12m i2e full electric city bus with 29 seats, 47 standees and 376kWh sodium nickel chloride batteries, was the least innovative (in terms of newness) of all the exhibits having already been around for several years. Sister company, Masats, producers of door systems, ramps and lifts and one of a growing number of component suppliers within the Irizar group, was celebrating 50 years in business at the show. Although there were no completely new products on the prominent Sunsundegui stand, there were upgrades to existing models and other items of interest with five vehicles exhibited. Greeting visitors when they entered hall nine was a high-spec Sunsundegui SC7 bodied Volvo B11R 6×2 chassis destined for the football club Malaga FC, but the main changes were to the SC5 and SB3 models which have had their features upgraded to bring them more in line with the SC7. As Technical Director, Felix Aramendia, explained, they both have new central ceiling panels that make access to components easier as well as new dash arrangements and, for the SB3 a three slatted metal strip grille. The SC5 gains the more easily maintained electric door from Masats fitted on the SC7 in place of the previous pneumatic one, leaving only the luggage flaps and some minor functions pneumatically controlled. The door window and the area around the lock are also altered. There is a new air conditioning system with a separate zone for the driver and a new command centre with seven inch screen to control many of the body functions. On top of this, the SC5s refrigerator has been repositioned to the right of the doorway (on left hand drive coaches) to improve accessibility to the entrance. 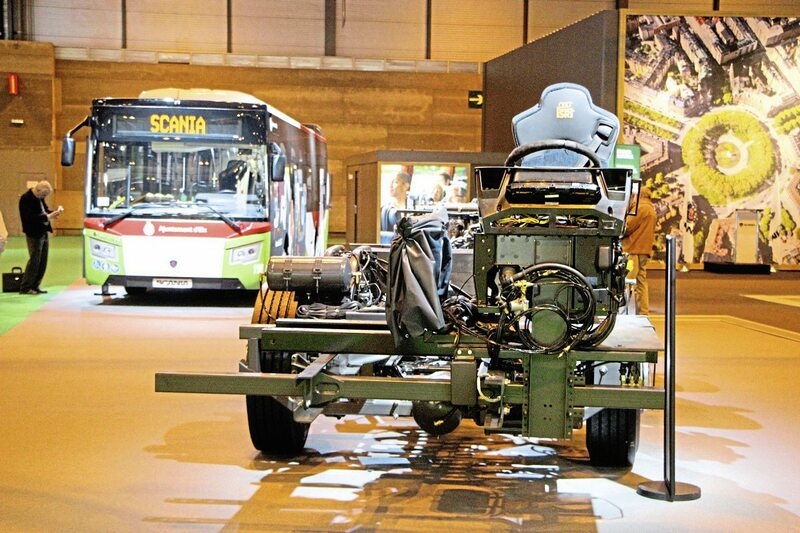 A 13m two-axle Volvo B11R ER430 chassis with Sunsundegui SC5 coachwork featuring 59 Sege seats and a Hidral wheelchair lift caused a degree of confusion because a number of people saw the name Bogas Bus on the side and assumed it was a biogas powered vehicle. Sales Manager, Alex Irizar, who many UK operators will know well, is to retire in June after a long career in the industry. We wish him well. Already in production with orders from several customers is a new full electric open top double deck bus, one of which was apparently outside the halls though I confess I didn’t see it. On the stand was the new SIL Class 2 intercity double decker on an MAN RR4 tri-axle chassis. According to the brochure it is available in 13m, 14m and 15m lengths, heights between 3.99m and 4.2m and on two or three axles (though two seems unlikely). Up to 100 seats is apparently possible, thought that shown had 95 and luggage capacity. The company would like to collaborate with Scania on an open top decker. It already works with Volvo, MAN and Iveco and is about to supply the first Urbis bodied Volvo hybrid deckers to Barcelona. On the minibus side, there was a new version of the Compa T coachbuilt body on the 4750mm wheelbase Iveco Daily that offers 29 seats and a four cubic metre boot rather than the usual capacity of up to 34 seats. An accessible version with double rear doors takes eight wheelchairs. On the Sprinter/Crafter based Vega XL a new rear shelf/bulkhead arrangement enables the driver to reconfigure the vehicle to reduce the seating capacity and increase the luggage space. Also new was the Daily 50C based Vendal minibus for up to 23 passengers with panoramic windows, a lowered luggage compartment and enhanced interior. There were no innovations on the Beulas stand where the display highlighted the wide range of chassis options it offers in Spain as well as its own extensive variety of model options. Exhibits were a 12.9m Volvo B11R Aura with 59 seats; a 13.9m VDL SBR based Glory with 56 seats and a double courier seat, a 12.9m MAN RR2 Aura with 59 seats and a 14.6m double deck Jewel on an MAN RR4 26.460 with 89 seats. Versions of the Jewel can be offered with less seats and up to 15 cubic metres of luggage capacity. Not exhibited but still offered are the Gianino/Stela on the MAN N14/N15 chassis at 7.5m, 8.3m, 9.0m and 9.5m and the superhigh Mythos. 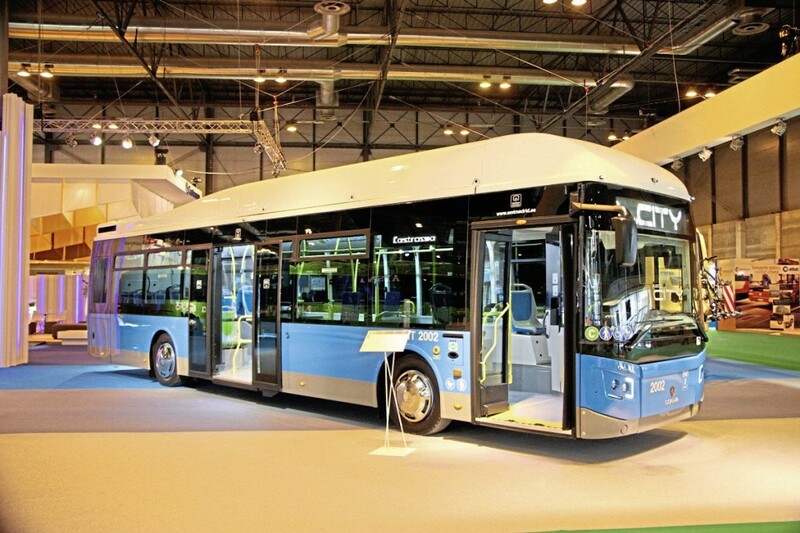 At the rear of the stand was a very different Eclipse based double decker, a fully electric open topper prototype using Actia equipment that is scheduled to begin trials in Barcelona in July. It has three packs of Nickel Manganese Cobalt (NMC) batteries, all mounted at the offside rear, with a capacity of 300kWh. These are charged overnight and need six hours to replenish. Consumption estimates are 2.3kWh per km. Range was said to be 150km and the price around €500,000, though this had not yet been finalised. The Salvador Caetano Group is celebrating 70 years in the business and initial talk at the launch was of the Cobus airside bus which is produced at its Gaia plant in Portugal. New electric versions were launched three years ago and are now regarded as mature enabling the next step to be taken, the launch of a new electric city bus using experience from the Cobus and technology from Siemens. 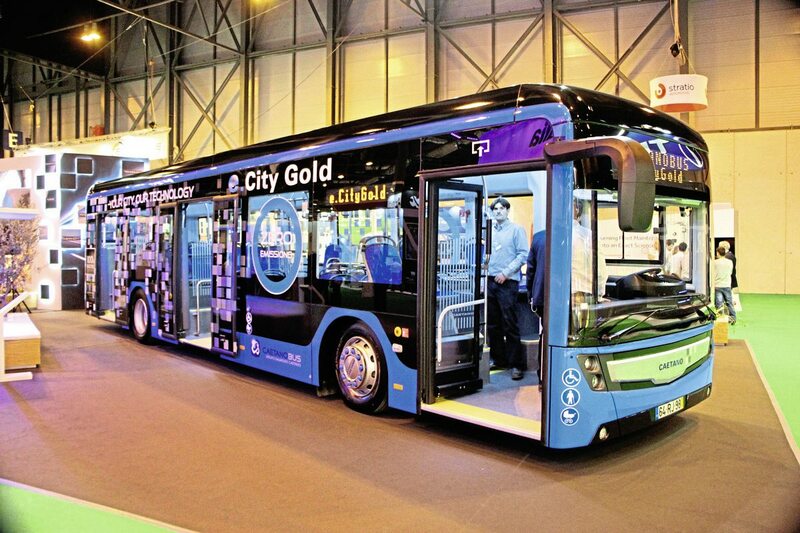 George Pinto of Caetano commented, ‘Our destiny is 100% electric.’ The e.City Gold is based on the aluminium structure of the existing City Gold model and will be offered in low floor and low entry formats in six lengths between 9.5m and 12.7m on two axles and two lengths in articulated form. That shown was a full low floor with three doors and an 88 passenger capacity. The synchronous motor has nominal power of 160kW at 1,500rpm and maximum torque of 2,500Nm drawing 350A. A payback period of six to eight years and a range of up to 200km is promised with a choice of fast or overnight charging. Caetano is hoping to succeed in the Spanish market with the Itrabus coach body for up to 31 passengers on the Iveco Daily, a model it already sells in the UK. An example appeared on the stand. 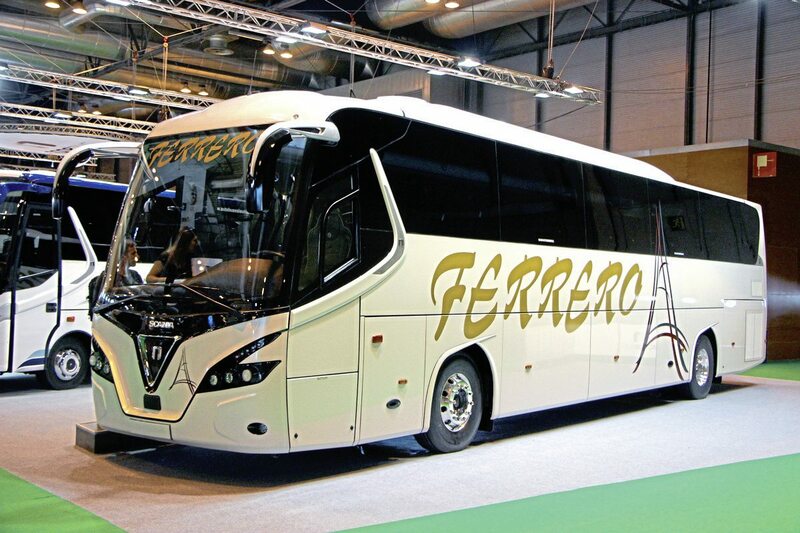 Castrosua is an important player on the Spanish bus and inter urban market and also offers the Stellae coach. 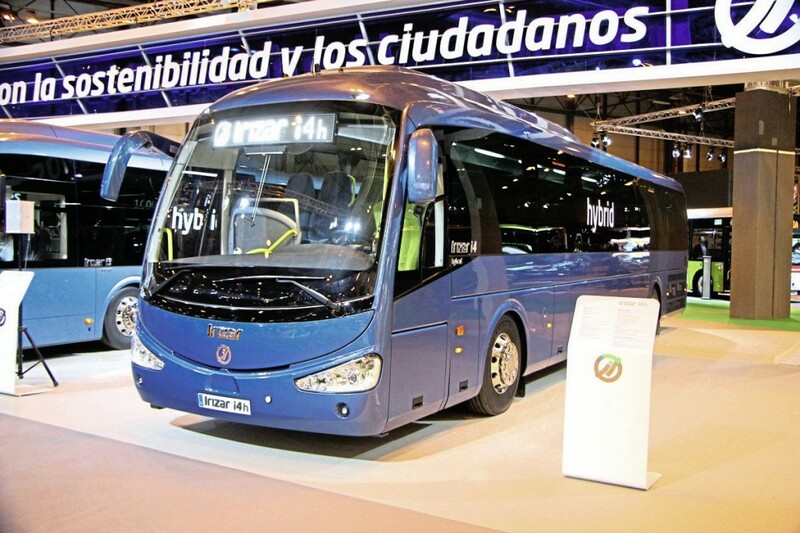 Representing the New City city bus range was a 12m two door vehicle in the blue of EMT Madrid. Mounted on a Scania NUB4x2 GNC gas fuelled chassis, it featured Thermo King X900 air conditioning, a Masats electric ramp, and Fainsa Metropolis seats for 27 passengers plus space for 58 standees. Also Scania gas powered was a 14.95m two door Magnus ES+ for ALSA, said to be the first tri-axle intercity gas bus manufactured in Europe. On the KIB 6×2 GNC base it offered 63 Civic V3 seats, 29 standees, composite side panels and a Hidral Evo 14 lift at the centre door. Rather a different Magnus was a low entry E model on a 12.82m Volvo B8RLE 4×2 diesel chassis for Tranvias de Sevilla featuring a rear mounted bike rack. According to the press release, you can buy a double deck Magnus, but I didn’t notice this in the small print until I got home and was unable to quiz them on what I believe may be a translation error. The coach shown was a three-axle Stellae 71 seater on an MAN RR4 chassis. Features included parking sensors, Multiplex electrics and a Hidral wheelchair lift to the rear of the centre door. 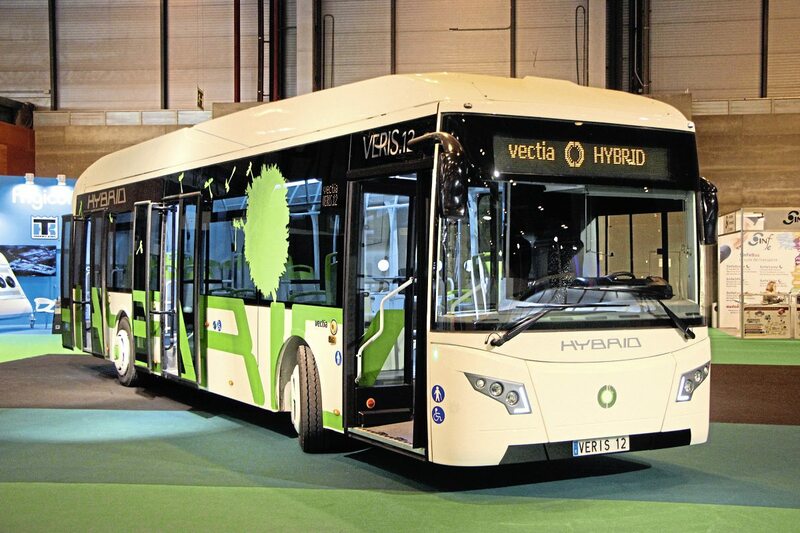 Vectia concentrates on alternative drive systems including hybrids and full electrics, working with train builder CAF (who built the Edinburgh trams) to produce an attractive range of city buses. Theirs was one of the few press conferences I didn’t manage to attend and the press release issued was in Spanish, though a brochure in English with covers showing London’s Embankment completely deserted revealed that it is ‘committed to developing its own technologies in critical systems as a key feature in delivering a high level of vehicle reliability.’ The 12m Veris.12 Hybrid has an electric EPS, a 180hp six-cylinder diesel engine and an ultracapacitor based energy storage system. The Veris.12 Hybrid+ adds extended autonomy in electric only mode and a Lithium Ion battery energy storage system. The smaller Teris.10 (available in 9.6m and 10.6m lengths) has the Siemens Elfa hybrid drive train and a four-cylinder 160hp diesel unit. 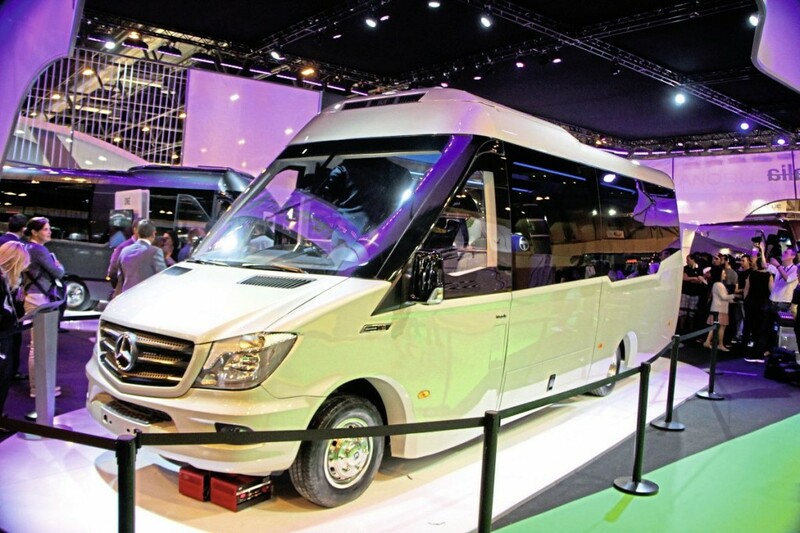 Car-Bus produce high quality coachbuilt conversions on Mercedes-Benz chassis as well as offering the futuristically styled 100% electric Wolta 6.0m long minibus in conjunction with Rampini of Italy. Rampini are responsible for the electrics which have a Siemens motor and inverter and Winston Battery LiFePO4 batteries with a choice of outputs. A Mercedes-Benz Van Partner, Car-Bus showed a variety of Spica minicoaches on Sprinter bases including an open top Panoramic version with seats in very bright colours and a low floor variant for city bus use. For disabled passengers, there was the Corvis PMR on a 519 for either 22 passengers or two and six wheelchairs. Represented in the UK by Connaught PSV, Ferqui showed a new model called the Nora, a body for mounting on the Iveco CC100 truck derived front engined chassis.. The Nora L shown had 36 recliners and a 6.0cu.m boot, while the Nora C had 31 seats and 4.8cu.m of luggage space. I think it is very difficult to achieve a stylish look for a coach on a truck derived chassis and this is one of the better ones. Also shown were a Sunrise 28-seat coachbuilt body on an Iveco Daily 70C18 and a Sunset conversion of the Mercedes-Benz Sprinter with high windscreen. Not offered in the UK to date, Integralia started the show with two prominent exhibits beneath dustsheets. These were removed during a press conference to reveal the new One model in touring and executive layouts which is additional to, rather than a replacement for the existing range. Based on the 5.5 tonne Sprinter 519 auto, and retaining full Mercedes-Benz warranty, the 7.5m long One has 2+2 seating for 25 passengers in Tourist form and 19 or 20 in VIP layout with a flat floor and more luggage space than existing models. Interior headroom is 1.93m. Pamplona based Integralia’s aim is to offer ‘more and more intensely personalised vehicles’ to meet the needs of its customers. To this end, every aspect of the interior is exclusive to the company, including the seats which were specially developed with Kiel. It currently sells in France, Spain and Germany working direct without distributors. Asked about any UK ambitions I was told, ‘why not?’ with the proviso that they wouldn’t sell anywhere without first having aftersales provision in place. The coaches shown were the first two completed, requiring continuous three shift working for the final week to ensure they appeared in time and there were signs of this, but by the Busworld show they will be fully productionised. The first deliveries to a Spanish operator will be made in September. I wasn’t entirely convinced by the rather angular rear styling but there were a lot of attractive aspects. Indcar plans to make itself more efficient and has taken on the marketing of its own products in France and Italy. MD Gael Queralt stressed the company’s proposals to add value for customers and mentioned the wide network of workshops across Europe, parts warehouses in Spain, Italy and France and the availability of substitution vehicles and extended warranties. 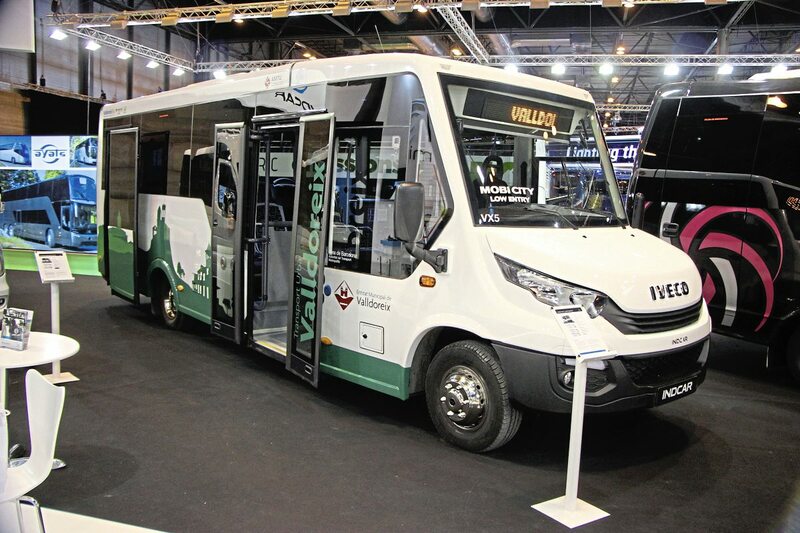 He launched Indcar’s ‘I love minibus’ campaign and stressed strong links with manufacturers which see Indcar recognised by Mercedes-Benz as a Van Partner and by Iveco’s Busmasters scheme with certification of the plants in both Spain and Romania. It produces the Wing, Mago and Next in Arbucies and the Strada and Mobi at Brasov. 75% of production, which was 475 units in 2016, is sold outside Spain. Launched earlier this year was the Mobi City Low Entry, an 8.55m city bus for 18 seated and 11 standing passengers with low floor areas at the front and rear. This was mounted on an Iveco Daily 70C18. In the UK, the associated Moseley companies sell the Next range on the Atego chassis. The most recent version launched was the Next L7 in 2016, shown in Madrid as a 27 seater with 4.3cu.m of luggage capacity on the Atego 1024L. 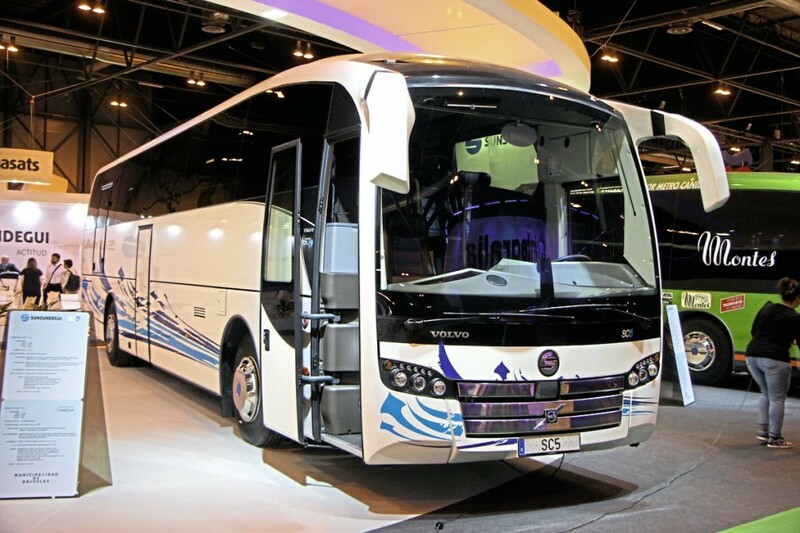 Larger 9.39m Next L9s with 37 seats were shown on the Atego 1224L and the MAN N14 chassis. On the IvecoCC100 was a Ferrari inspired 8.9m 30 seat Mago2 F1 for a Modena company. Future plans include an electric version of the open top Mago Cabrio. 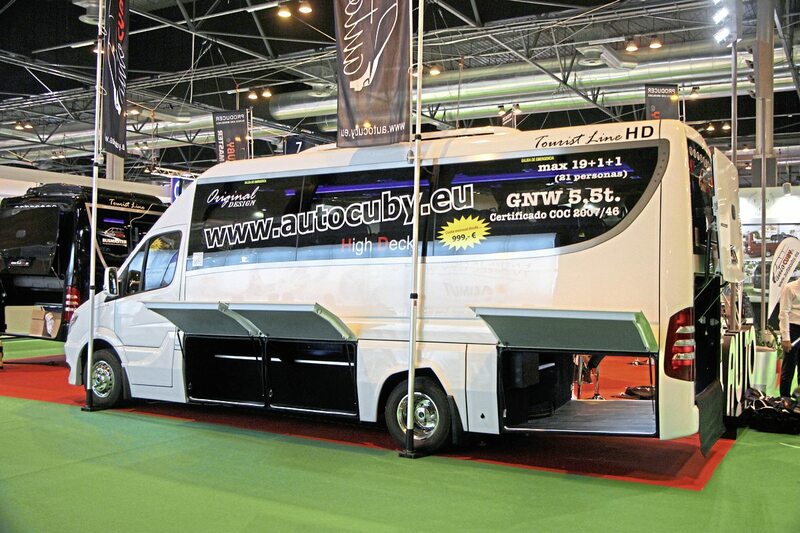 Also shown were a 28 seat Wing on the Iveco Daily 70C18 and a 19 seat Strada on a Sprinter 519. Nogebus has had its problems but survives on a smaller scale, still offering a broad coach portfolio. Contrasting with a 6.95m 22 seat Sprinter with unusual top supported racks that the curtains ran behind was a 15m long Titanium with 67 seats on an MAN RR4 26.500 chassis with TipMatic gearbox. Also on an MAN chassis, but this time a front engined N14 with D0836FLAA unit and ZF 12AS1210 automated transmission was a 37 seat Touring H with rear continental door. The fourth exhibit was a 13.2m Touring Gold HD 59 seater, again with rear continental door, on a Scania K450 chassis with GR801R transmission. 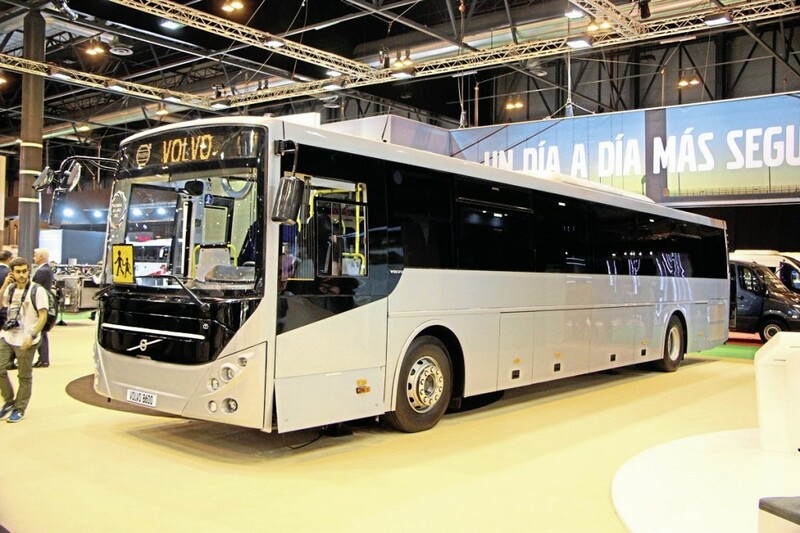 I talked to Stefan Guttmann, Vice President Commercial Development for Volvo Bus and head of the Spanish market, Jaime Verdu, who told me that when the Spanish market had halved following the 2008 recession, it was the public transport sector that had fared the worst. Despite this Volvo had started to move into city markets with its hybrid designs, successfully selling small numbers into important city fleets. It was now on the tender lists and had been quite successful in the city segment selling over 200 hybrids, which was as many as in Sweden, making it the market leader locally. A 7900 Electric hybrid for Sales Lentz appeared on the stand, complete with recharging gantry. They revealed that Volvo is now offering a left hand drive version of the B5LH hybrid double deck in Spain with eight Unvi bodied 12m open toppers scheduled for delivery to Barcelona before the end of the year. It hopes to offer the same concept in other cities. 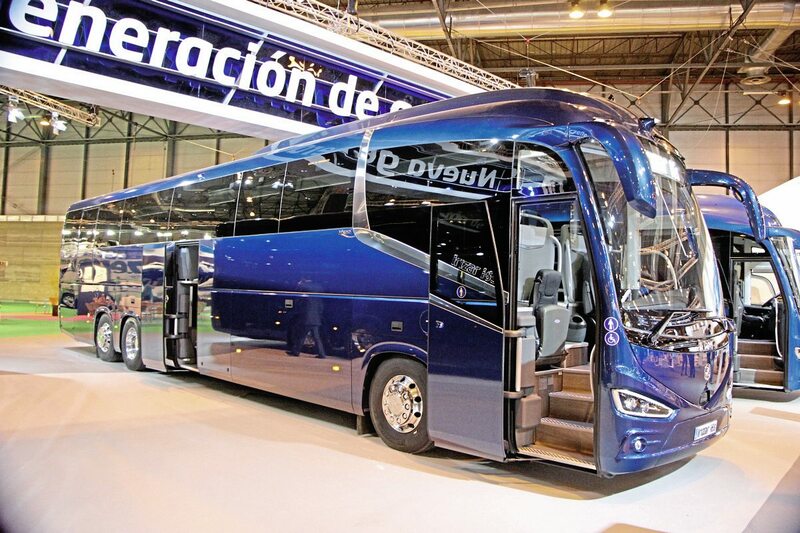 In the coach market Volvo had supplied 290 units in a total market of 1,294. Only the products of Irizar, Sunsundegui, Beulas, Castrosua and Unvi are homologated for sale locally, none of them directly by Volvo which only sells the chassis. New on the stand for Spain was a steel framed Volvo 8600 which had been built at the plant in Bangalore, India. Though it employs a B8R chassis it is supplied as an integral with doors from Masats, air conditioning from Carrier and Turkish built Kiel seats. 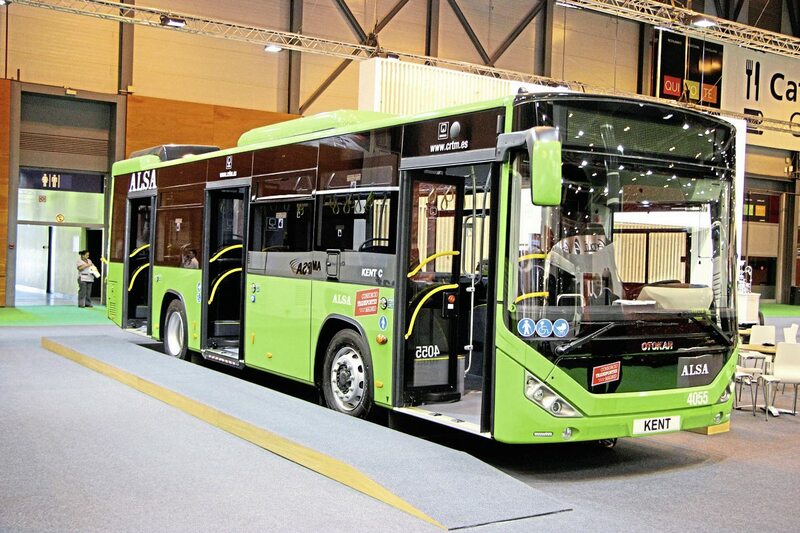 It is a budget bus for school type work and will only be offered in France and Spain. The show model offered 55 fixed and two folding seats though it has a four place podium that can be removed to make space for a further two double seats. Prices start at €180,000 and the specification can be enhanced from single to double glazing and from the I-shift box to a ZF full automatic. 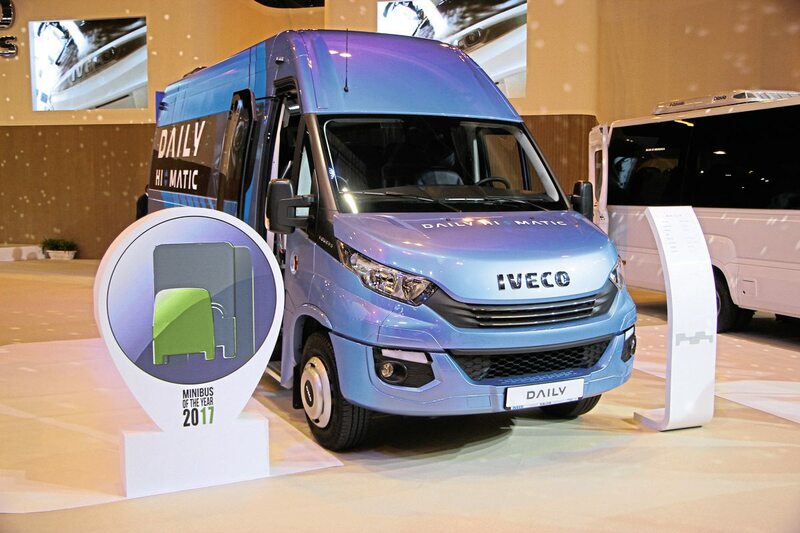 The big news for Iveco was the Daily Tourys winning the first ever Minibus of the Year title awarded by the International Bus & Coach of the Year Jury following the hotly contested Minibus Euro Test staged in Madrid last month which attracted seven candidates. The Tourys, which is available in the UK, features up to 19 Kiel Touristic three point belted recliners on podium mounted rails, a 2.5 cu.m rear luggage compartment, LED lights, a multimedia system, USB ports, LCD monitor and air conditioning. It has a 180hp three-litre diesel engine and the Hi-Matic eight-speed automatic gearbox, as well as Telma retarder, rear air suspension and R66 rollover compliance. Daily takes over 30% of the Spanish market and on the stand, in addition to the Tourys, it was shown with coachwork by Unvi, Indcar and Ferqui. Also from Ferqui was an example of its new Nora body on the EuroMidi CC100. Further exhibits were a Crossway Line and a Magelys coach but the biggest attention was paid to a model making its debut in Spain, the latest version of the Evadys. This is powered by the Cursor 9 400hp engine which is SCR only. It is available in 12m and 13m length options for a capacity of up to 63 seats and a maximum luggage capacity of up to 12cu.m. Daimler’s presence was a considerable one reflecting the 26.1% share of the Spanish market the company enjoys. Setra vehicles lined up in echelon along one side of the stand and Mercedes-Benz along the other, with the locally built OC500 RF2546 chassis displayed unbodied at the front. Representing Setra were the new 14.6m S418 UL Business, the TopClass S516HDH, and the smallest and biggest members of the Comfort Class family – the 14.95m tri-axle S519HD with seats for 58 and the 10.465m S511HD 30 seater. A lower floor S516MD was outside with other demonstrators, some of which were available for test drives. 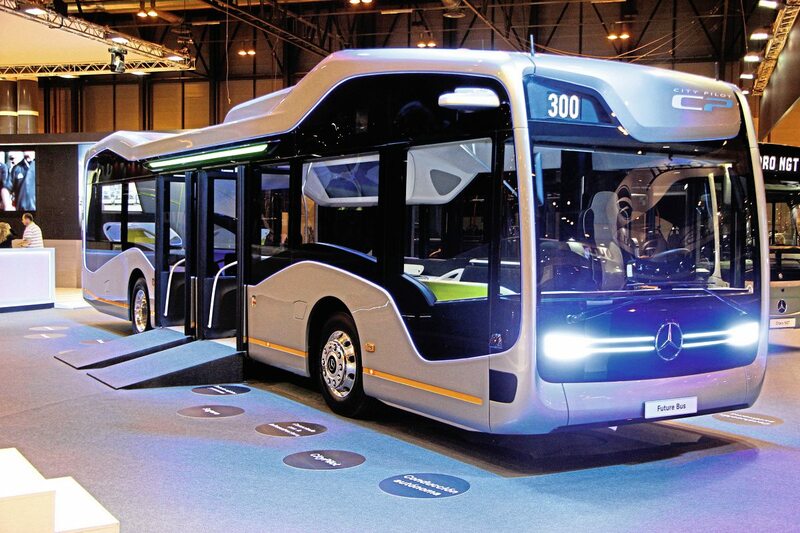 If I say there was nothing new from Mercedes-Benz it is a bit harsh because one of the exhibits was The Bus of the Future, the fully autonomously driveable city bus with futuristic exterior and interior styling that we brought you a full report on last year. Also present were a Citaro NGT natural gas bus, a 12.9m Tourismo 16RHD/2 two-axle coach with OM470 394hp engine and 55 TSE Luxline seats, and a 7.7m Sprinter City 65 city minibus. The OC500 can be supplied at up to 15m long with the OM470 unit rated at 455hp or optionally 428hp and in Spain comes with the automated Powershift transmission. 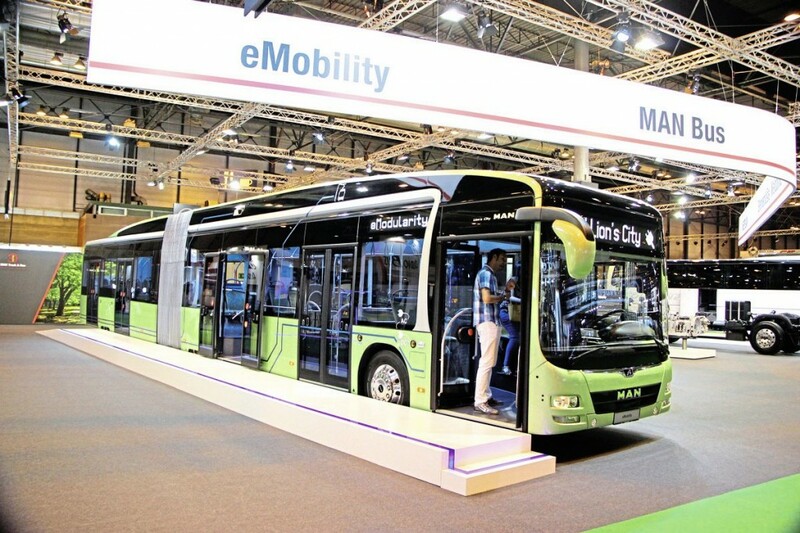 Restating its eMobility plans, MAN confirmed it would launch a pre-series battery electric bus and introduce a demonstration fleet in 2018, with series production of a full battery electric bus planned for late 2019. These will be modular 12m and 18m models. Innovation partnerships have already been agreed in Wolfsburg, Munich and Hannover and an additional one has now been signed with Voyages Emile Weber in Luxemburg. It aims to produce a bus that charges overnight and has a range of 200km, although it points out that features such as air conditioning can have ‘considerable influence’ on this. On the stand was an articulated Lions City showing where MAN is on eMobility. New was a 13.254m long two-axle version of the InterCity model with 63 seats and the D0836.LOH80 290hp engine with a choice of manual and automatic transmissions. For chassis customers the latest Euro6C engines are available with 420hp, 460hp and 500hp offering an additional 200Nm of torque at each rating with no increase in engine speed. The TipMatic gearbox is now linked to predictive GPS. Completing the display was a 12.2m Neoplan Tourliner to the latest specification. Apparently this is the first time Tourliner has been offered in Spain, though both Cityliner and Starliner have previously been offered. Nine-litre gas and 11-litre diesel engine units, a GRSO895R gearbox with Opticruise and a display showing Scania’s exhaust after-treatment system were also shown. 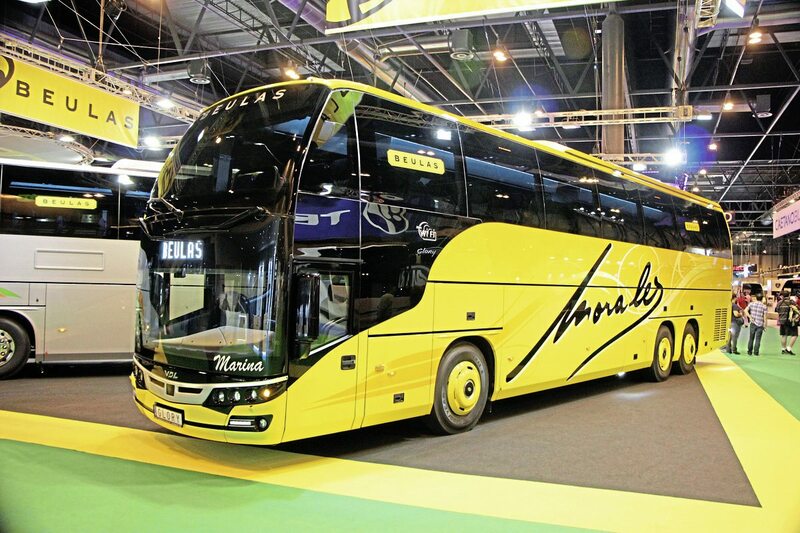 General director of Solaris Iberica, Anna Lopez, said that, ‘All customers that put their trust in us are brave because we are a new brand,’ and whilst that is true because Solaris has only been selling in Spain for two years, it is also true that it now has in excess of 15,000 buses on the road and around 200 of these are in Spain, where 18 hybrids will be delivered to TMB Barcelona in September. Both of the vehicles shown were 12m Urbino 12s, one the Urbino 12 Electric that won the International Bus of the Year 2017 title and the other an Urbino 12 CNG with Cummins ISLG 320hp engine, a Voith Diwa6 automatic box and revised longitudinally mounted gas tanks enabling the height to be lowered. Following the Solaris appearance at last year’s Bus Euro Test in Brussels, the Belgian SRWT concern has placed an order for 208 Urbino 12 hybrids which is the biggest order yet placed for Solaris hybrids. With this and other orders including a three year contract for 300 Interurbinos for Italy, Solaris is on course to set a new production record of around 1,400 units this year. Four Cummins engined coaches were shown by King Long, the smallest of which was the 9m long C9 with 320hp ISB6.7unit and 35 seats. A similarly powered 9.9m C10 seated 39 and the 12.2m C12 had the ISL9e rated at 400hp unit and seated 55. Completing the line up was a 12.2m long, 3.3m high U12 model with double centre door and lift that was certified for 55 seated and 20 standing passengers. It had a 380hp ISL9e engine. Will we see it in the UK or won’t we? 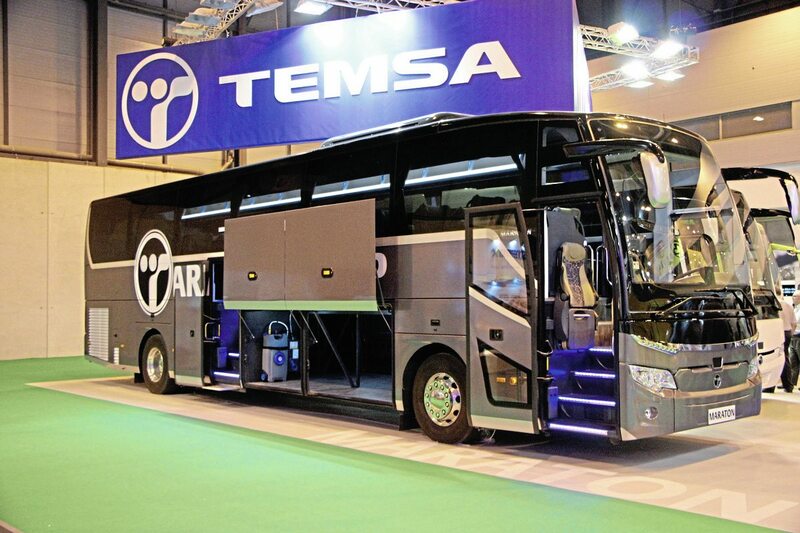 I don’t know yet but alongside Temsa’s HD12 coach, already popular in the UK as the HD12 Safari, was an example of the attractive Maraton coach. I am told that another possibility for the UK market, though no decision has yet been taken, is a lower height 13m version of the Safari on two axles that would offer enhanced capacity. Also shown was the front engined MD7 minicoach which I understand is unlikely to come to the UK. In Spain, where the business is currently focused on retail coach sales of the Vectio T and Navigo T models, the current Otokar parc is around 350 vehicles. A new Vectio TH certified to R66.02 rollover regulations and equipped with a Braun wheelchair lift was displayed. It is destined for ALSA. 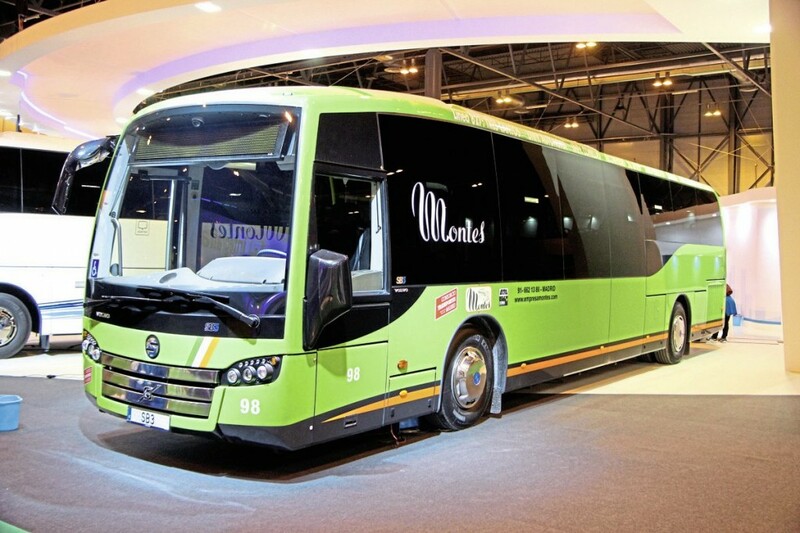 Also shown was a Territo U intercity and a 7.7m Navigo T. The company now aims to go further and increase bus sales and has started participating in tenders. On the stand was a 10.8m version of the Kent for ALSA which takes their Kent fleet into double figures. Known for some very creative conversions, this year’s eye-catcher was a superhigh 5.5 tonne Sprinter 519 marketed as the Cuby Tourist Line HD. Certifiable with up to 19 passenger seats, it has a raised floor and extensive underfloor luggage space including a coach rear end. A Romanian company that imports to the UK through Jonathan Vamplew, an operator/dealer based in Llanfair Caereinion, is CentoTrans whose main activity is transport provision. The manufacturer arm has been trading since November 2012 and builds on Mercedes Benz Sprinters in a 3,000sqm factory, producing 400 vehicles to date of which 90 were exported. Products range from 8+1 seats to 22+1+1 on an extended 519. All vehicles sold in the UK have been long 519s with another currently going through the build process. 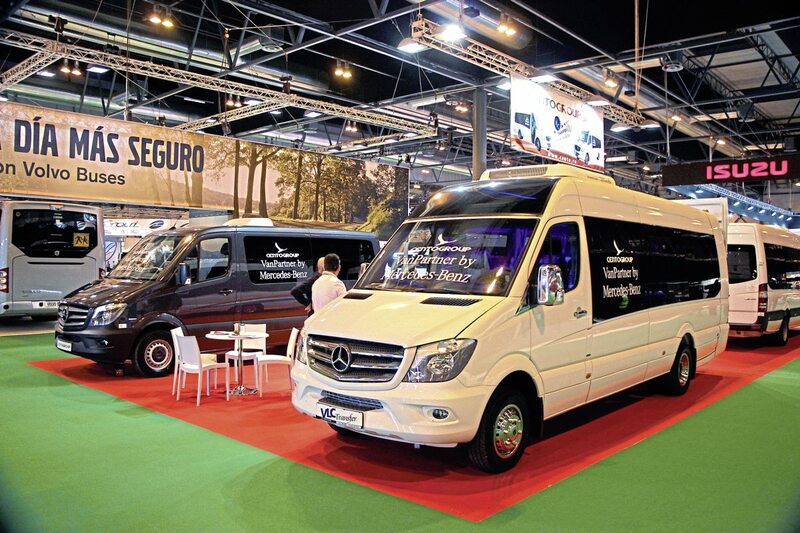 Bus Prestige, which was promoting its recognition as a Mercedes-Benz Van Partner, showed Exclusive and Tourist conversions of the Sprinter 519, both of which retained their double rear doors and offered 19 seats. A welcome adjunct to the show was a display of historic vehicles along one side of a hall. Among Spanish brands such as Hispano Suiza and Pegaso, was a splendid bonneted Leyland Comet with coachwork built in Valencia by Xativa in 1949. The Madrid Show is a well organised event and always a pleasure to attend. Open for longer hours and over more days than the Birmingham events we are accustomed to, it is a more relaxed affair with wide aisles, generally spacious stands and plenty of local ham and tortilla to graze upon. The modern facilities are located only a short taxi or subway ride from the airport. 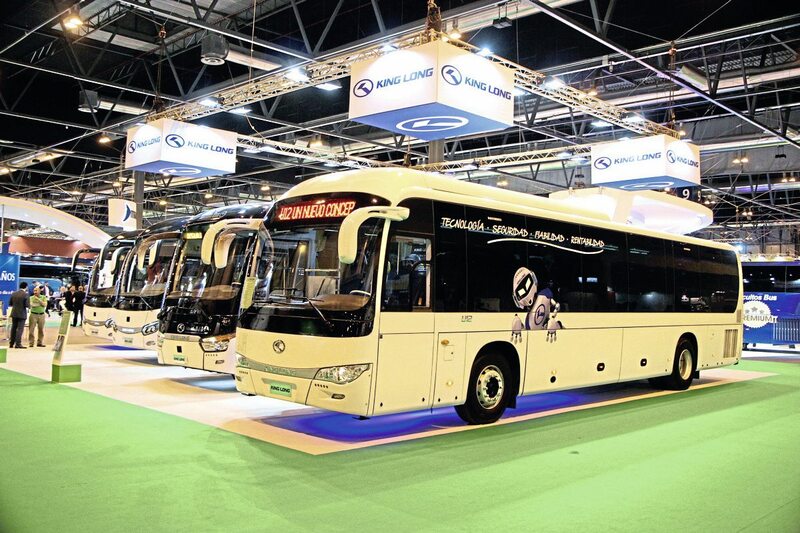 Though undoubtedly worthy of International Show status, there are manufacturers we will see at Kortrijk in October who were not present in Madrid, among them VDL, Van Hool and any of the British contingent, with only King Long of the many Chinese contenders in attendance. I find attendances difficult to judge because though there never seem to be huge numbers of public visitors, crowds gather for the various set-piece events. For the press, the facilities and support are excellent though you do get ushered from one press conference to another for much of the first day, with some presentations greatly more worthwhile than others.